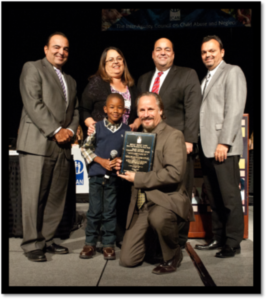 Our founder, Bryan “Eddie” Nash, was named the 2013 recipient of the Frank Vicencia Champion for Children’s Award. The award was presented at the Inter-Agency Council on Child Abuse and Neglect (ICAN) Nexus Conference on October 16th 2013. The prestigious award is given annually to someone who is committed to the prevention of child abuse and neglect. Last year’s recipient was Father Gregory Boyle, founder and Executive Director of Homeboy Industries. For the second year in a row, the J.F. Shea Center hosted the campers on November 24th for a reunion to kick off the Holiday Season. Once again, The Shea Center’s staff and volunteers created a fun event that will provide lasting memories for our foster youth. The siblings were treated to horseback rides, barn tours, and the feeding and grooming of the horses. The Laguna Chapter of National Charity League, Inc., provided volunteers who painted faces, helped with crafts and card making and served lunch to the 150 campers, counselors, and volunteers attending. The Orange County Society for the Prevention of Cruelty to Animals (OCSPCA) came with ten dogs who provided the campers with an outlet for love and support. Camp Director, Tricia Tiner, and her dedicated team of volunteer counselors led the foster youth through the various activities and ensured an enjoyable time was had by all of the campers. 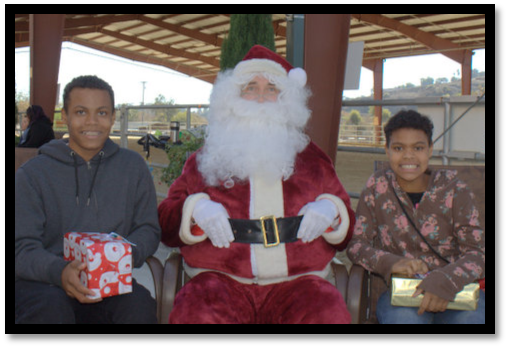 As a final surprise, Santa arrived on horseback with a gift for each of the siblings. Their pictures were taken with Santa and together they opened their gifts. Cindy Roe and Marcia Pontoni generously worked over the past couple of weeks collecting and wrapping the gifts. Over 100 foster care siblings participated in the fifth annual Camp To Belong Orange County, sponsored by the Eddie Nash Foundation. Camp To Belong Orange County was held July 29th thru August 3rd 2013 at the Irvine Ranch Outdoor Education Center. It was a resounding success as the siblings, separated in foster care placement, were reunited for a week of togetherness. The highlight for many was the Birthday Party, when they gave each other presents and decorated a shared cake. The symbolic celebrating of missed birthdays is one of the many activities the Camp does to support the sibling bond and create lifelong memories. In addition, the campers make pillows and quilts for each other and a scrapbook of the week’s adventures together. This year we welcomed a new Camp Director, Tricia Tiner. Tricia was already an active member of the team prior to taking the lead and had participated in prior camps in Orange County as well as other locations. She and her core team did a wonderful job making the Camp a success and we look forward to her continued involvement in 2014. There was excitement during the first days of Camp as we had NBC Nightly News onsite filming a “Making a Difference” segment about Camp To Belong. Click here to view it! The Eddie Nash Foundation was especially grateful for all of the community support this year. Just to name a few: FunServices provided a fantastic carnival for the campers to enjoy. The OCSPCA Canine Literacy Program created a unique experience for the younger campers by having them sit and read with therapy dogs. CSU Fullerton hosted the foster youth (ages 13-18) for a tour and discussion about college. The Laguna Chapter of National Charity League, a mother/daughter service organization, sponsored Inspiration Night as well as provided the volunteer support for the week. Inspiration Night also included a dynamic and inspiring talk by Sharaud D. Moore of the Freedom Writers Foundation. As the campers were leaving, one young boy summed up the experience by saying that the best thing about Camp is “being with my brother”. On November 16th 2013, our Passports To Success program on Financial Literacy was held at Santiago Canyon College. Forty-seven foster youth signed up for the program to learn about how money works and doesn’t work in their lives. Trinity Wallace-Ellis, Dr. Greg Manning and Bryan “Eddie” Nash developed the impressive program. Eric Black, award-winning comedian from Comedy Central, was the Keynote Speaker. He spoke with humor of his life story growing up in poverty and gangs and provided the foster youth with encouragement and inspiration. Will Warren, an Eddie Nash Foundation Board Member and Manager at a Union Bank branch, led them in an exercise in “Needs versus Wants” and they discussed the differences between debit and credit. Our founder, Bryan Nash, shared his story of working hard and achieving financial stability. Caregivers and mentors also attend the all day event to provide support and learn how to provide consistency to the messages delivered. While Trinity Wallace-Ellis works with the foster youth, Dr. Greg Manning discusses the concepts with the caregivers and mentors. The foster youth were attentive and engaged as they learned another key tool to independence.